Events | Enjoy a Date With SheaMoisture Saturday! It's the weekend baby! 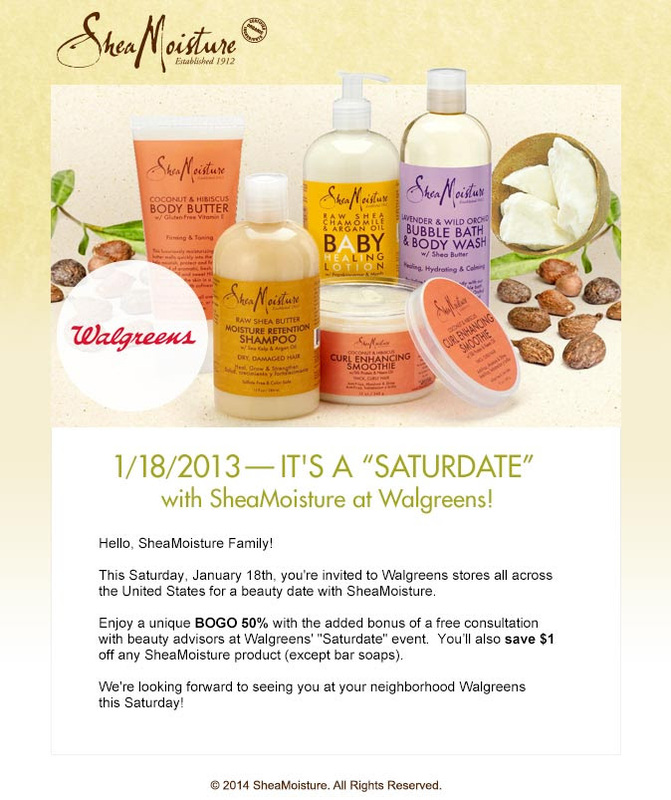 This Saturday, stop by your local Walgreens for a beauty date with SheaMoisture. You can receive a free consultation with Walgreens advisors and savings! This Saturday only, go to Walgreens for the Buy One Get One 50% off sale and take a selfie of yourself next to your purchased products. Post the picture on the SheaMoisture Facebook page, and a winner will be randomly selected from photos to win $100 worth of SheaMoisture products. Photos must be posted by end of day Saturday, and a winner will be announced Monday on Facebook. Are you heading to Walgreens this weekend? You just made me remember one of the hardest parts of going natural. Although I was mentally prepared, all I knew how to do was wrap my hair! LOL. I definitely had to pretty much learn from scratch. Plus, you are so beautiful with your short cut. You be trippin!!! You sound like another commenter and that seems to be a common theme for those with fine hair. It may be a process for you, but from my opinion, I would never be able to tell. Your hair is always fierce! Thanks LeSha! You and I are definitely in the same boat. It was and still is hard to style at times, but I love my hair! I will be there now especially since I'm washing my hair this weekend. BRAVO! I completely agree with everything you said. I recently shared with someone via Twitter that I honestly didn't learn much from YouTube as I was going natural. I learned the most from stylists and workshops. Thanks for stopping by and commenting Shea! More power to you for even making it for a year of transitioning. I totally agree with you in the regard that if you make up your mind, you just do it. I think the one thing I dreaded the most was telling people constantly why I cut my hair because that was the question I knew everyone was going to ask. Thanks so much for commenting and sharing the post! I definitely agree that it takes time to learn your hair. Even though I was natural before, I always went to the salon so I had no idea how to wash, condition or anything. I thank God I stuck with it. I definitely agree with you on losing my length. I think that was the only thing that concerned me the entire time! Thank you so much for stopping by and commenting! I really think having that support system helps so much! My mother went natural before I did and seeing her go through it did help me a lot! That's awesome that your sister was there to help you. Thanks for stopping by Dormaine! LOL! You are so sweet. But you know my forehead looks like a small dish saucer. I need enough hair to cover it!